I am a horse for a single harness, not cut out for tandem or teamwork … for well I know that in order to attain any definite goal, it is imperative that one person do the thinking and the commanding. [A] person doesn’t become a runner because someone recommends it. People basically become runners because they’re meant to. This autobiographical journey seen through the eyes of an avid runner was written by the famous Japanese novelist, Murakami Haruki and was originally published in Japan in 2007 as 「走ることについて語る時に僕の語ること」Hashiru koto ni tsuite kataru toki ni boku no kataru koto (literally “What I talk about when I talk about running). Have you ever felt self-conscious about running? I remember when I first got back into it three years ago, I was always thinking that someone was watching me. Seems I wasn’t alone in this thought. When I first started running I couldn’t run long distances. I could only run for about twenty minutes, or thirty. That much left me panting, my heart pounding, my legs shaky. It was to be expected, though, since I hadn’t really exercised for a long time. At first, I was also a little embarrassed to have people in the neighborhood see me running— the same feeling I had upon first seeing the title novelist put in parentheses after my name. But as I continued to run, my body started to accept the fact that it was running, and I could gradually increase the distance. 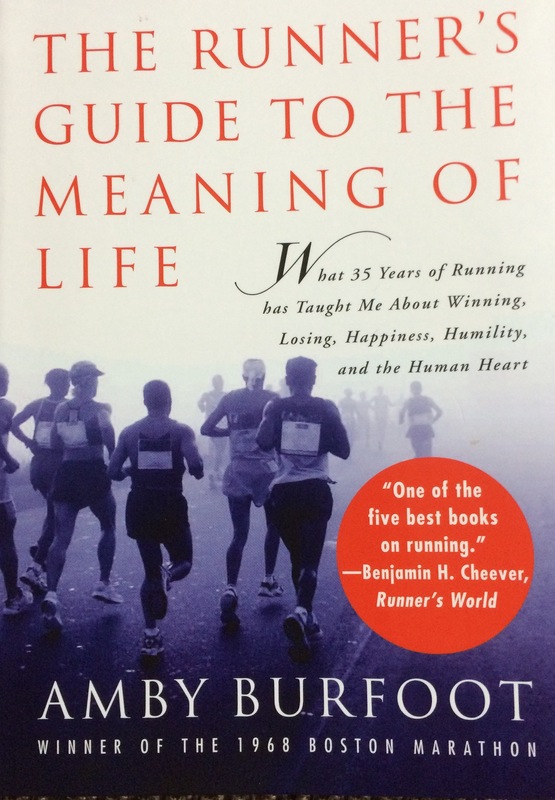 This book not only inspired me to keep pushing on as a runner, but also as a writer. I had already started writing this blog, but had stalled many times. If you’re going to while away the years, it’s far better to live them with clear goals and fully alive than in a fog. As I just entered my forties last year, Murakami’s talk of his running peak which came in his late forties, and the goals he had at that time strike a chord with me as I am at a similar place in my own running journey, even down to very similar running speeds: I broke 3:30:00 for the first time ever just two months ago in February. My peak as a runner came in my late forties. Before then I’d aimed at running a full marathon in three and a half hours, a pace of exactly one kilometer in five minutes, or one mile in eight. Sometimes I broke three and a half hours, sometimes not (more often not). 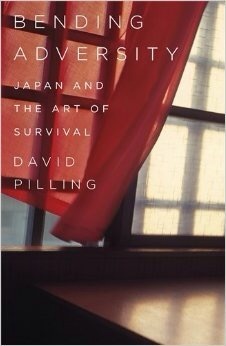 It is through his inspiration that I decided to name my blog “Suffering is Optional”. Murakami recalls a conversation he had with a fellow runner, whose older brother told him that allowing ourselves to suffer is actually a choice. If we choose to focus on that pain, we will increase it and it is all we will think about. But like the author says, pain is a necessary part of the journey of growth. Without making the effort, we will never reach the next goal or target to better ourselves. If pain weren’t involved, who in the world would ever go to the trouble of taking part in sports like the triathlon or the marathon, which demand such an investment of time and energy? It’s precisely because of the pain, precisely because we want to overcome that pain, that we can get the feeling, through this process, of really being alive or at least a partial sense of it. Your quality of experience is based not on standards such as time or ranking, but on finally awakening to an awareness of the fluidity within action itself. If things go well, that is. And while running can be a social activity as many members of running clubs will attest, it is largely a solitary activity where we compete against ourselves. Like Murakami, I have always been energized by my own quiet time. I guess that makes me an introvert rather than an extrovert. I’ve had this tendency ever since I was young, when, given a choice, I much preferred reading books on my own or concentrating on listening to music over being with someone else. Within the pages of this book, I found a true kindred spirit. I strongly recommend this book to all runners, writers and to all who like to push themselves to the next level. The ONE Thing was written by Gary Keller and Jay Papasan and first published in Great Britain in 2013 by John Murray Press, Hodder & Stoughton. The best books usually make the argument that so-called time management is really about choice, focus and self management rather than attempting to manage time. Thousands of books have been written on the subject and I have wasted time reading a few of them – finding bits here and there that work for a while but never quite give me the answers I am looking for. Getting Things Done: The Art of Stress-Free Productivity by David Allen was another book that influenced me a number of years ago. But I would be hard-pressed to remember the five steps he suggests or any other snippets of advice that I could quote today as having become a part of how I manage myself or my time. The ONE Thing is different. In arguing for focus, it really keeps things simple with a very clear and uncluttered approach. Being based on one question repeatedly asked (in very slightly differing ways which could admittedly get old or annoying quite quickly) to drill from big picture to small detail it feels easy to remember and to adopt straight away. For me, it’s very reminiscent of the Toyota way of asking Why? five times. I won’t ruin the book for those who want to read it, and I’m sure the authors wouldn’t be too pleased if I gave away the key question. The authors quote research that says it takes an average of 66 days to form a habit. So even in its simplicity, they are not promising quick wins like so many self-help evangelists do. The ONE Thing is based on a premise provided by a Russian proverb, За двумя зайцами погонишься – ни одного не поймаешь (Za dvumya zaitsami pogonish’sya – ni odnovo nye poimaesh’) If you chase two rabbits, you will catch neither. It espouses blocking off time each day to focus on something (not a new idea and one which I have read in many books), which I think ignores relationships. It is not as easy as simply turning down a meeting request from your manager. But it is hard to argue with the logic that time devoted to key goals rather than being bogged down or disturbed by less important stuff has a compound effect. The authors use a domino metaphor and illustrate quite well that from research proven in 1983 that a smaller domino is capable of knocking down a domino fifty percent larger than its own size: starting with a standard domino (which would in turn knock down a domino 1.5 times its size) by the 10th iteration, the domino would be the height of an American football quarterback; by the 23rd, the Eiffel Tower; and the 31st taller than Everest. Their metaphor is not lost on the reader in saying that by working on important things each day in a focused way, we can achieve great things. Ask me in 66 days if I got results! After writing Part 1 this morning, I went to wake my wife up and give her her anniversary present. As the 7th anniversary in the UK is wool, I decided to go with the American convention: copper and bought two tumblers for us both. Now that we are in April, I didn’t think my wife would appreciate a woolly jumper. My wife surprised me with a really nice brown leather bag, which my daughter helped her choose. I like brown leather and it will really go well with some of the other brown items I use or wear for work. After a fairly slow and leisurely morning, where I used rain as an excuse to not run, we went out at about 11:30. We enjoyed a nice Japanese lunch at Aqua City in Odaiba and then took a look around a few of the shops. By 2:30, we were ready for our main event and went to the fourth floor of Decks to get our picture drawn. As with every year, the artist was different again and so we looked forward to how it would come out. I must be honest. When I first saw it, I wasn’t so thrilled. But that has happened many times – and after a while, I get used to it. Caricature is often like that and this time is no different. In fact, I’m already getting used to it. Our kids look sprightly with their rosy cheeks. They are both looking upwards in anticipation of something(?) while my wife and I look quite tired. I suppose it has been quite a demanding year, with lots of new things happening: a new job for me, and new schools for both kids. So it is probably a fair reflection. After all, an artist can only draw what they see, and a caricaturist’s job is to exaggerate what they see. What I read from my kids’ expressions is that it is my job to help them learn and to navigate their new worlds. So it should be another exciting and probably stressful year ahead. I will continue to worry only about what I can control and not about what I cannot. The artist commented at one point that my hair looked green. Maybe I left some shampoo in my hair today. I had been more concerned about going grey. I would love to hear from you. What do you think of this year’s picture? How does it compare to previous years? Which is your favourite? 2010-2015: Which days of the week do I run the most? It was 9:45 pm on a Friday in 2010 (July 30th), when I started using Runkeeper to track my running activities. Since then, until the end of March 2015, I have run 611 activities. Which days do I run the most? Number of activities: This refers to the number of different times run on a given day of the week. 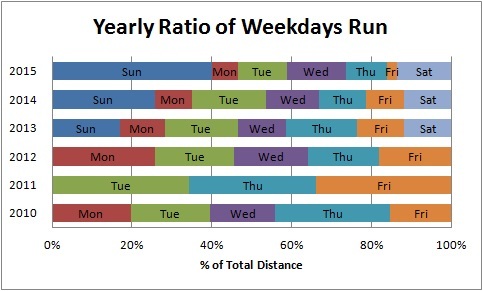 Average distance: The average number of kilometres run on a given day of the week. Total distance: Total kilometres run on a given day of the week. There were very few runs in 2010, and even fewer in 2011. In June 2012, after making a commitment in a classroom to run 30 minutes or 5 kilometres every weekday (Mon-Fri) morning, I got back into running. 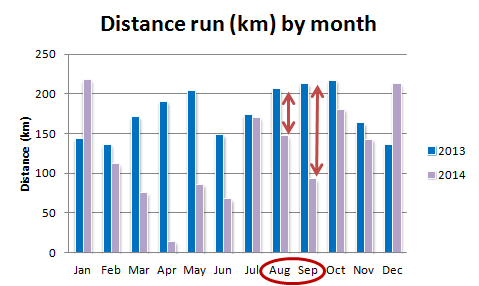 The table below shows how in 2012, my runs were almost uniformly split Monday through to Friday. In fact, I ran 26 times on a Monday and a Friday; 25 on a Tuesday and Thursday; and 23 on a Wednesday. My big year was 2013 – when I decided to run my first marathon in ten years. This meant a departure from running solely short distances on weekdays and a shift to runs of various lengths and tempos. Tuesdays and Thursday became by favoured days. The following year, Tuesdays were the clear frontrunner, while this year, I seem to prefer weekends and Wednesdays. Sundays are clearly big running days. I try to take advantage of not having to go to work, and get in longer runs in preparation for marathons. The Sunday figures do also include a few full marathons, which has the effect of pushing up the number. 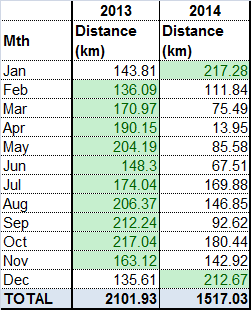 I am trying to emulate 2013 with a challenging target of 2015 kilometres. While I am not measuring the number of runs I make, it is clear that the fewer I do, the longer each run will have to be. Having only run 40 times this year, I will have to up the ante to make the target. If I maintain my higher average of 11.05km per run this year, I will have to run at least 182 times or about 3.5 times per week. 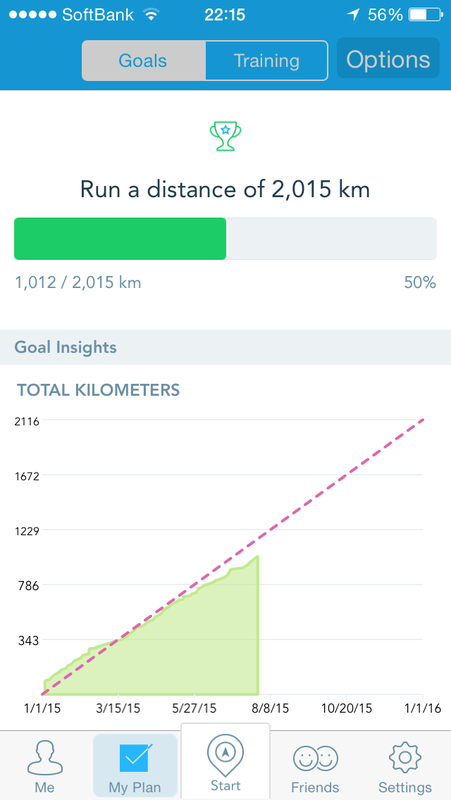 I ran further on Sundays in 2014 than any other day/period (405 kilometres). While the sheer number of activities on Tuesdays and Thursdays in 2013 contributed to total runs around 380 kilometres for each. A quarter of the way into 2015, with 9 activities covering nearly 177 kilometres, I hope to easily top that. One running goal missed and one achieved. That’s how 2014 ended. 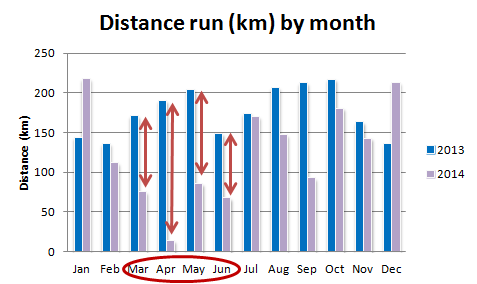 2013 went so well, achieving the 2000-kilometre target weeks before year-end. 2014 was a different story and though I covered less distance, it was a much harder journey. It didn’t kill me so it must have made me stronger in true Nietzsche tradition. With scars to prove it, I feel invigorated and ready for the next challenge. Over the last two and a half years since running has come back into my life, it has been more than a mere metaphor for my life itself. Setting goals has pushed me to some huge efforts but has also at times made me want to throw in the towel! Here is an account of the last year and what I have learnt along the way. The year started really well. After achieving my 2000k target in early December and setting a new target to run 1000k in the five months until my 40th birthday, I was on the crest of a wave. I went on to run my biggest ever month in January. This set me up nicely for “Tokyo” at the end of February. At the Tokyo Marathon, I set a very ambitious 3:30:00 target – 10 minutes quicker than my PB. Tokyo was the first of three marathons I ran last year. My feelings at the finish were mixed: joy at finishing with a good time and not walking; despair at not meeting my target. My thinking was turning towards self doubt and I was choosing to suffer – not just during the race, but after too. My extended honeymoon period with running was now over and I found it hard to get out on the road again. Hindsight now tells me that I managed to get to the end without walking because I had trained so rigorously. It would take me until later in the year to learn this lesson of tenacity. My passion for running reached its lowest ebb. I took a rest after the exertions of Tokyo. While I needed to be averaging 200k per month to meet my goal, I struggled to run more than 75 in March and a paltry baker’s dozen in April. By the time of my 40th birthday, I was nearly 500k (a mere 48%) shy of my goal. I have to take this opportunity here to thank my wife again for all the birthday party planning – behind my back – in bringing my father and many of my friends to Kamata to surprise me! I didn’t have the appetite to set a new goal right away having failed so miserably! If I achieve the above, I succeed in going for a run. When excuses set in, it is usually because I wait until after work to run. In 2013 I didn’t use it as an excuse as I ran more than 200k in August and September in preparation for the Osaka Marathon. In 2014, this dropped significantly though I did give myself a ready-made excuse: a career change! July to September happened to coincide with the biggest change in my career in ten years, when I brought a close to my very rewarding and enjoyable time in publishing for a role working with a wider cross-section of industries spanning the public and private sector. While I stepped up my efforts in July, as I got closer to leaving my old job and starting my new job, I let busy-ness keep me off the road more often than I would have liked. It was easy at the time to justify taking a day off here and there, but as I re-learned later, I need to go for a run to refresh my spirit and relieve the stress of the day! In some ways, I saw the garden as a metaphor for certain aspects of my life. A leader must also tend his garden; he, too, plants seeds, and then watches, cultivates, and harvests the results. Like the gardener, a leader must take responsibility for what he cultivates; he must mind his work, try to repel enemies, preserve what can be preserved, and eliminate what cannot succeed. October and November brought new challenges as I learned my new job. Anyone who has changed careers will have experienced “Impostor Syndrome“. During my first three months, I allowed myself many times to suffer from these symptoms. Once again, it was running that provided me with a crutch, when at other times I might have used my travails as an excuse to take a day off training here and there. So I did my best to run as much as I could. I took my running gear on a business trip and managed to get runs in in Northern Ireland (Belfast), Scotland (beautiful Edinburgh including the Royal Mile and the castle), and my hometown in England (past Warwick Castle – an even more beautiful construction than Edinburgh Castle – excuse my bias)! Of course it helped that I had to run two marathons during this period. At the end of October, I ran Osaka for the second time. After my 3:32 at Tokyo, I entered the race confident that I could run 3:30. I was quietly confident of 3:20. What I chose to ignore was my training record. With a poor summer record to compare against the previous year, I was deluding myself. While I was on target for 3:16:00 at halfway, I hit the wall at 26 kilometres and faded fast. Though I will spare the photo, it didn’t help that I had developed a blood blister covering a quarter of my left foot! Succumbing to the pain, I made myself suffer through the shame of walking, hobbling, trotting, cramping up and getting a free massage through the last sixteen kilometres. A poor but justifiable return on my investment: 4:27:45 – more than an hour slower than my secret target. Just a few days after Osaka, I received a package in the post from Fujisan Marathon – a race around two of the five lakes near Mt. Fuji at the end of November. In the excitement of changing jobs, I had forgotten that I had entered! My wife frantically booked the last room in a hotel right near the start line. Thanks again for the support you give to me Eri! My expectations were much lower, but with the benefit of Osaka and my autumn runs still in my legs, I ran the course in 3:40:54. If I hadn’t succumbed yet again to walking with four kilometres to go, I would have achieved around 3:35:00. It worked! 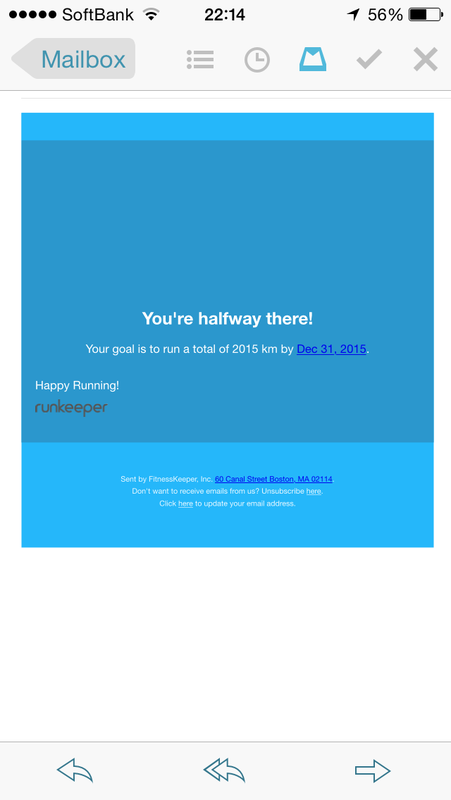 On New Year’s Eve, I managed to run the last 14 kilometres needed in order to meet my goal. 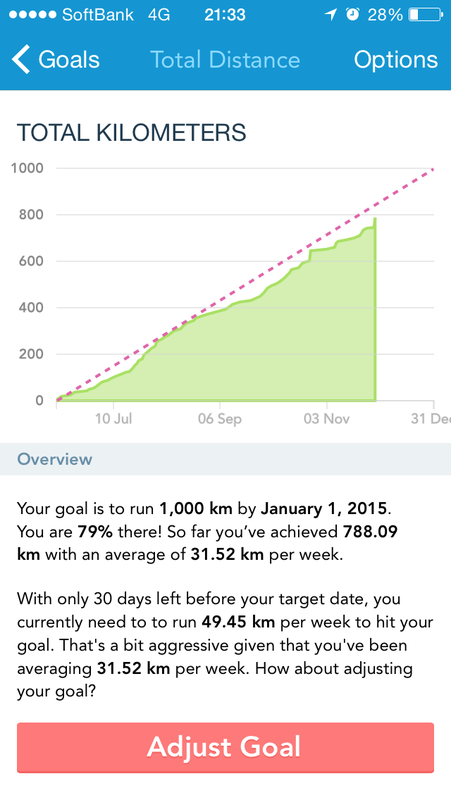 Seven days into 2015, I am tracking nicely towards my 2,015km target. As I re-learned the importance of habit, each month I will commit to running at least 150 kilometres. My next marathon will be in my favourite Japanese city of Kyoto. And if you fancy a run in Tokyo from time to time, let me know! It would be great to encourage one another!